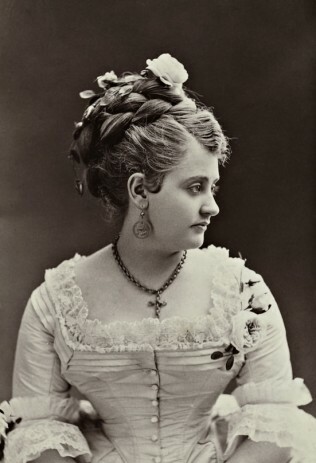 Auction of rare photos brings renewed interest in the fascinating life of a 19th century motion picture pioneer. His photographs are immediately familiar to us. Edweard Muybridge (nee Edward James Muggeridge, 1830-1904) is a British pioneer in the photographic arts, who first became well known in America for his 1868 images of Yosemite. He later became important for his seminal work in photographic studies of motion and in motion-picture projection. Less familiar is the dramatic personal story of this eccentric Victorian genius who did so much to advance modern day cinematography. 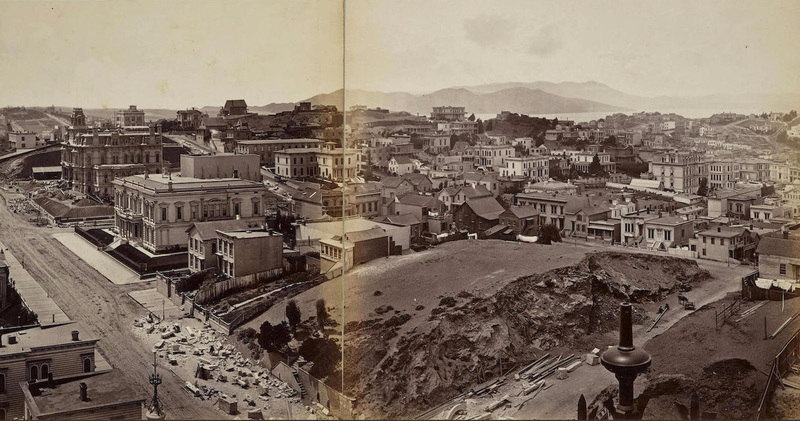 Recently, one of his published portfolio’s, an 11-part series of panoramic photographs of San Francisco as seen from the then top of industrialist Mark Hopkins’s home at California and Mason Streets, 1877 came up for auction. According to Muybridge biographer, David Harris, the panorama portfolio took Muybridge approximately five hours to complete. He began in the late morning with a view towards the south-west and moved in a clockwise direction moving the camera away from the sun. By mid-afternoon when made his final view the sun had moved 90-degrees. The albumen prints were mounted accordion-style on 11 leaves of buff paper, mounted to a single piece of linen; with the photographer's credit, title, and copyright in letterpress on the central plate; the whole enclosed into, dark red cloth covers with the title and photographer's name in gilt. The panorama is expected to draw $50,000 at auction. From Encyclopedia Brittanica: “...Muybridge’s experiments in photographing motion began in 1872, when the railroad magnate Leland Stanford hired him to prove that during a particular moment in a trotting horse’s gait, all four legs are off the ground simultaneously. His first efforts were unsuccessful because his camera lacked a fast shutter. The project was then interrupted while Muybridge was being tried for the murder of his wife’s lover. 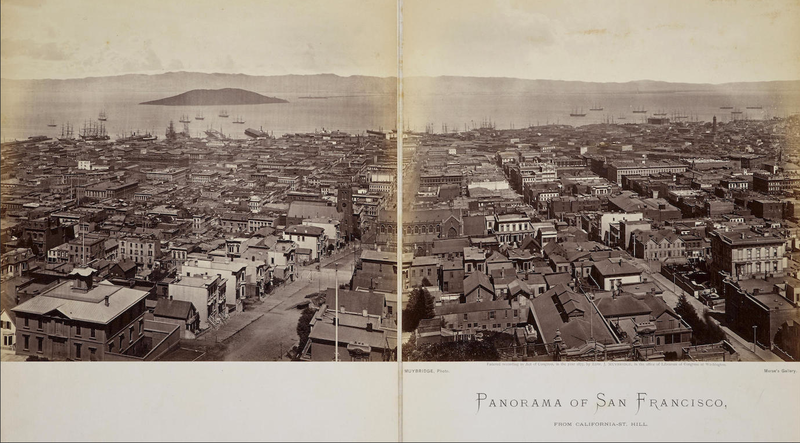 Although he was acquitted, he found it expedient to travel for a number of years in Mexico and Central America, making publicity photographs for the Union Pacific Railroad, a company owned by Stanford. 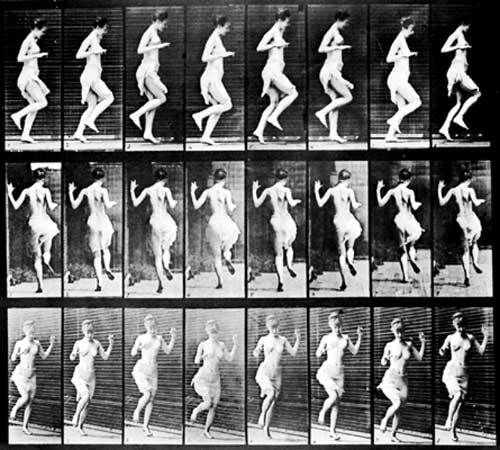 “In 1877 he returned to California and resumed his experiments in motion photography...” For the rest of Brittanica’s essay on Muybridge click here. Aside from his groundbreaking innovation in photography, Muybridge had an entirely different reputation in 1874 – that of a man, who tracked down his wife’s lover and shot him through the heart. His life story is worthy of a modern film treatment. Forty-two year old, Muybridge married a 21-year-old divorcee Flora Stone in 1872. They had a baby boy, Floredo Helios Muybridge, two years later. But Muybridge thought Floredo might not have been his son after discovering a series of letters between his wife and drama critic Major Harry Larkyns. 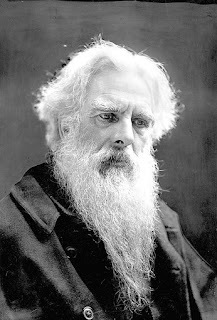 Reportedly, she also sent a picture of Floredo to Larkyns with the caption “Little Harry.”Muybridge decided to take matters into his own hands. He shot Larkyns after finding him in Calistoga. When Muybridge was put on trial in 1875, he pleaded insanity, but then changed his defense to “justifiable homicide,” or killing without bad intent. At his murder trial in 1875, the jury rejected an insanity plea but accepted the defense of justifiable homicide, finding Muybridge not guilty of murder. After the acquittal, Muybridge sailed for Central America and spent the next year in "working exile."